This meal was both delicious and nutritious. The pan sauce made all the difference. I had a bit of a surprise recently. In the morning, still apparently partly asleep, I pulled out of my freezer what I thought were two of the thickest steaks I’ve seen in quite a while. I had two of these to deal with, although mine were a little smaller. 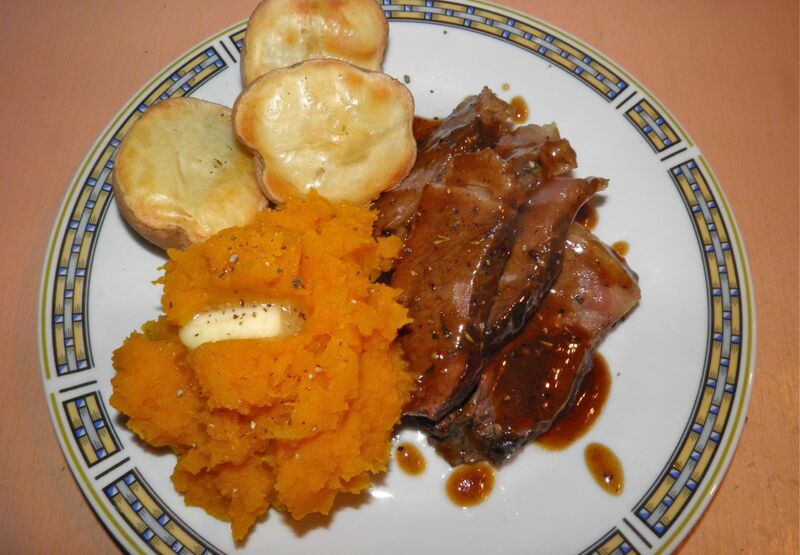 Oh well, when life gives you lemons…or in this case pot roasts, you just buck up and deal with them. I watch a lot of cooking shows – too many if you ask some people, so I am well versed in the art of searing meat and finishing it in the oven. It’s a superior, and fairly fast way of preparing a roast. I also knew that was about the best way possible to seal in as much juice as possible while still getting a well cooked piece of meat. So I set about my task. 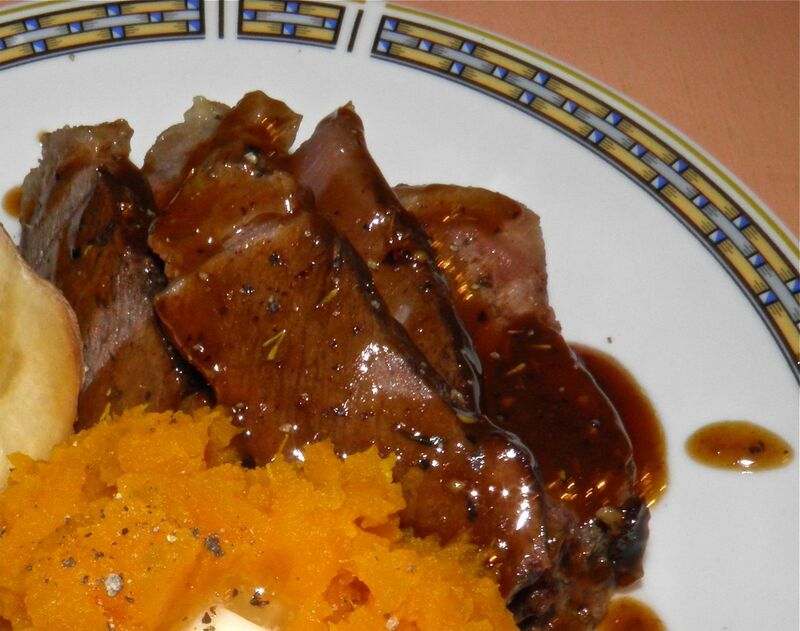 Searing a good crust on roast and then finishing in the oven gives you the best of two worlds. 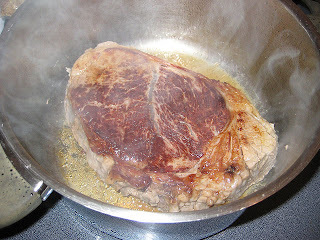 First, you have a delicious fond in the bottom of your pan for use in pan sauce, as well as control on how browned your meat is before roasting. Second, tenting the meat in the oven lets the roast “baste” itself during cooking, and you have collected juice all ready for pan sauce, which is never something to discard. To round out the meal I baked potatoes in the oven at the same time as the roast, and cooked some farm-fresh squash mashed with plenty of butter. The spicy pan sauce was a remarkable addition to the slices of beef. It’s more than just gravy, to be sure! Heat the oil in a cast iron (ovenproof) frying pan. Salt and pepper the roast(s). Sear the beef very well on both sides. After the beef is browned, place tin foil over the top and put the pan in the oven to finish baking. Bake until the internal temperature reaches 150°F for rare, 160°F for medium or 170°F for well. It’s your preference. Medium took 45 minutes on my two pot roasts. Remove the roast(s) from the oven and let rest tented with the foil on a plate. Take a look at your pan. You should have about 1/2-3/4 cup of liquid remaining behind. If not top it up with a little water. Heat the pan juice on top of the stove. Add the thyme, cayenne, black pepper and Worcestershire sauce and whisk together. Mix the cornstarch and tbsp of water and add to the pan sauce. Cook until thickened. Slice the rested beef and drizzle with the pan sauce. Recipe: Louisiana Shrimp Gumbo, good and spicy!